I tried out a brand new science curriculum over the past few weeks. 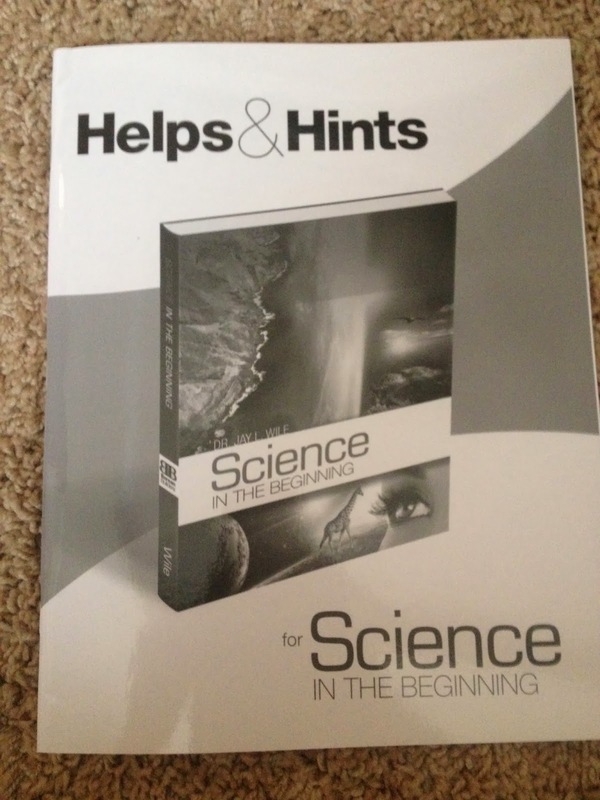 We’re not science people and I’m always searching for the perfect science curriculum for our family, so I’m was excited to see a new option for homeschool families. 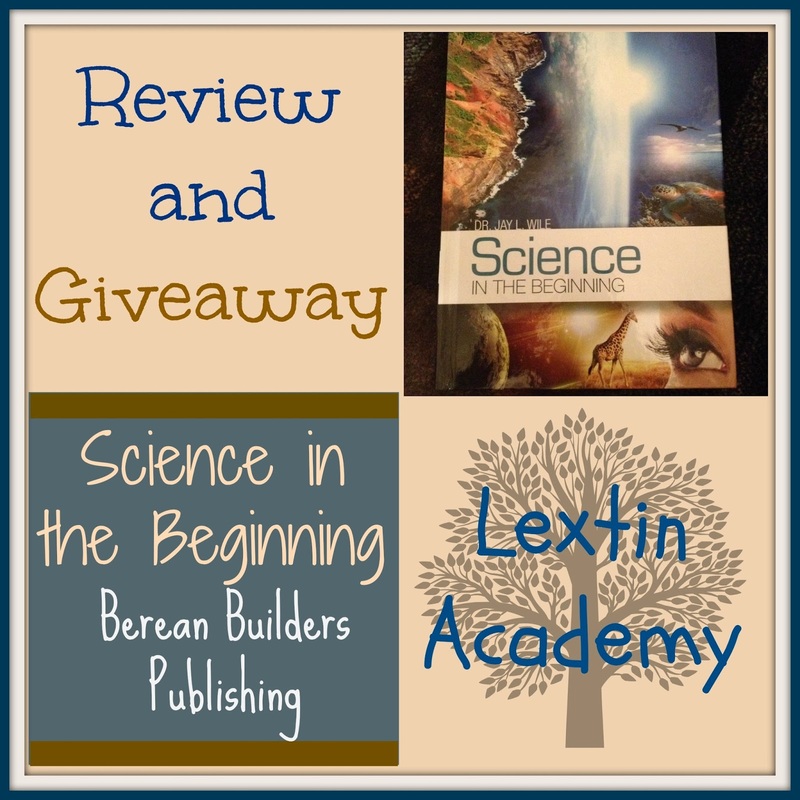 What did we think of Science in the Beginning from Berean Builders Publishing? Read my review to find out! And don’t forget to enter the giveaway at the bottom! Yes, the publisher is allowing me to give away one copy of the curriculum! 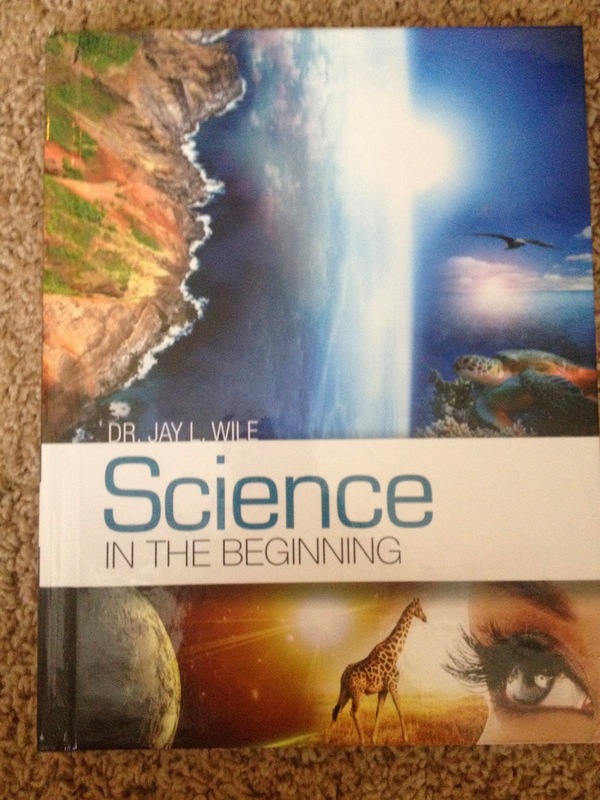 Science in the Beginning is the first book in a new series of science texts for elementary students from Dr. Jay L. Wile. The series will examine science through a historical perspective. This first book takes the student through each day of Biblical creation and examines the science concepts that can be learned from each day. The name of the company, Berean Builders Publishing, is taken from the verse Acts 17:11. In this passage, Luke writes about the believers in Berea who were eager to receive the Gospel message and daily examined the Scriptures to see if what Paul said was true. The purpose of the curriculum from Berean Builders is to teach students to think critically and examine Scripture as they learn, just as the Berean citizens did. Science in the Ancient World – This book will cover scientific discoveries from the time of Thales to daVinci. Science in the 16th and 17th Centuries – This book will cover events from the Scientific Revolution and Copernicus to the work of Vesalius. The books will focus on the individual scientists, their discoveries, and how their discoveries impacted the scientific community as a whole. Here are some sample lessons from the first book to try out this new curriculum. The curriculum consists of one hardback text with a soft cover Helps and Hints book that retails for $39 for both books together. The text has 15 lessons for each day of creation, which makes a total of 90 lessons. The first 12 lessons of each creation day are regular lessons, with the last 3 being challenge lessons. The challenge lessons are for students who want to go more in depth on the subject. To complete the book in one school year, you can choose to do science twice a week, skipping the challenge lessons and finishing the book in a typical school year. Or, you can choose to do science every other day and include the challenge lessons and still finish the book within a typical school year. Each lesson is 3 pages. There is one experiment or demonstration for each lesson (and sometimes more for some lessons). Many of the lessons begin with the demonstration to illustrate the topic. The text of the lesson contains clear and concise explanations of the topic with important vocabulary words in bold face. At the end of each daily lesson, there is a review section. This section contains review questions for 3 age groups. The parent can read through the review questions and decide on the level that best suits her student. The questions for the youngest students are simple short answer questions that can be answered orally or written in a notebook. The next level contains instructions for a writing an explanation of a more detailed question. The oldest section has more in-depth writing required and often has the student making predictions or thinking critically about the lesson or the experiment. The first section of the text contains a supply list for each day of creation. And the back of the book contains a glossary of vocabulary terms as well as an index of topics. The Helps and Hints book is for the parent. 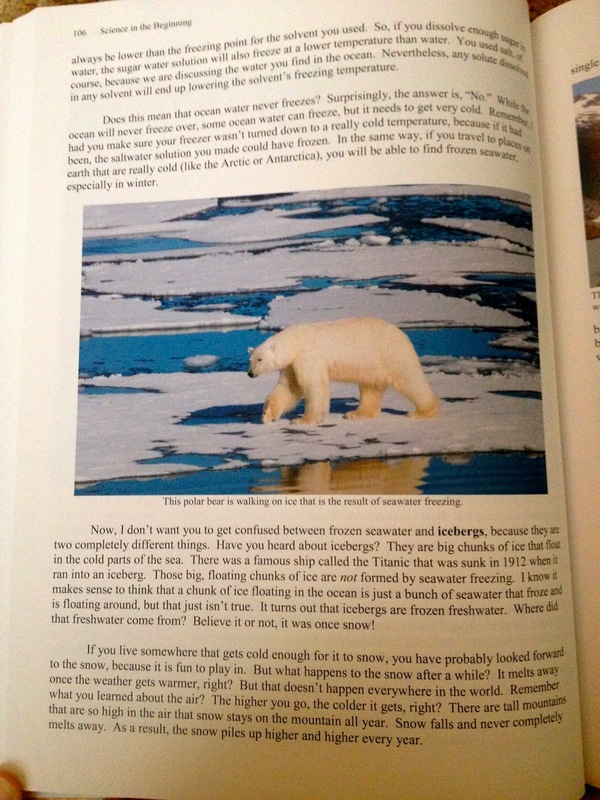 The first section of the book contains all the answers and explanations for each review section. The last part of the book contains tests for the text, with two tests for each day of creation. Each test covers 6 lessons. Answers to the tests are included. This science series is geared for students in any elementary grade and can be used as a multi-grade curriculum with each student answering the review questions at his or her level. I chose to do 2 science lessons per week and skip the challenge lessons for now. As my children are older and we cycle back through the series, I’ll have my older children complete the challenge lessons. So, I decided to save those for later! I used this curriculum only with Curly (2nd grade). We did our experiments together – usually with Tiger and Bee looking on and wondering what we were doing. Then I read the text to Curly (although she could have read much of it herself). While I read she illustrated a picture of the lesson topic or of the experiment we performed. We discussed the concepts as we read together. At the end of our lesson I asked her the questions for the youngest students. I helped her phrase her responses in complete sentences and then I wrote them down at the bottom of her illustrated page as the narration to our lesson. Then I put the pages in her notebook. By the end of our science study she will have created her very own illustrated notebook of science topics. I didn’t give Curly the tests but I did pull a few questions from them as an oral review once we had finished each section of 6 lessons. I reviewed the Law of Energy Conservation with her. Then we read about batteries. The experiment was to test the brightness of a flashlight with two batteries and then remove one battery, replacing it with a wad of aluminum foil, and testing the brightness of the beam with only 1 battery. Curly was surprised to see the difference in the beam. We then discussed how energy is converted into radiant energy and the flashlight with one battery had less energy to convert, making the light dimmer. 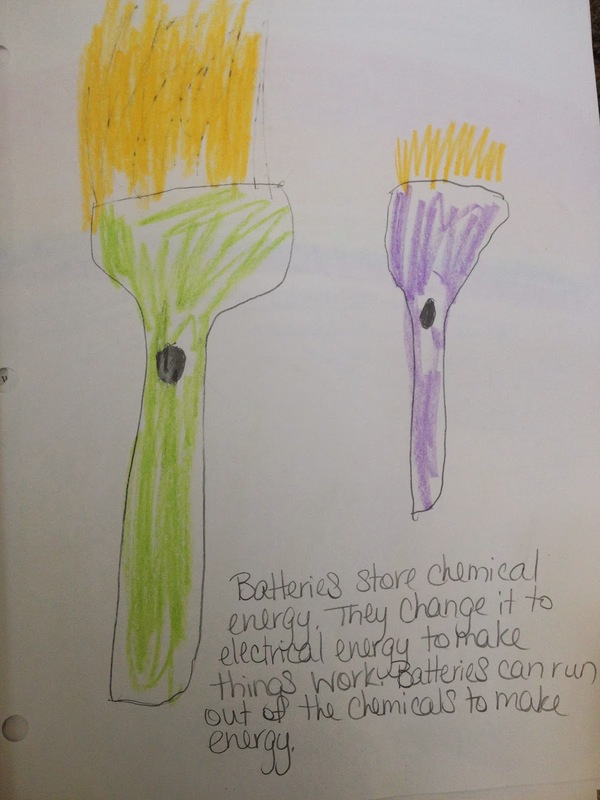 Curly learned how batteries work – they convert stored chemical energy into electrical energy, creating electricity and powering flashlights and other battery operated things. We then discussed what happens when batteries run out of chemical energy and how rechargeable batteries work. What form of energy does a battery actually store? Why does a battery go dead after it has been used a while? Older students were to write in a notebook what energy conversions take place for a toy car to move. Oldest students were to do the previous writing assignment as well as what would happen if the batteries in the toy car go dead and you only replace two of the batteries, leaving one dead battery in the car. Then the student is to write about what would happen if he replaced only one of the dead batteries with a new one, leaving two dead batteries in the car. I am not a science person. I will just be honest with that one! I would rather not do science and I do NOT enjoy science experiments. Usually they consist of me gathering tons of supplies, setting them up, performing the experiment, (or watching the experiment fail), and then cleaning up the mess. During this time my kids become bored and ask me when I’ll be done. What is wrong with this picture? I’m the one doing all their work! They should be the ones participating in science experiments, but because they are young and many experiments have multiple steps, they have to watch from the sidelines. So, I’m always skeptical of science curricula. I have great intentions, but many of them are rarely used at my house. The text is written from a Christian perspective. I love that I can teach my kids Biblical truths through science lessons and that the lessons align with our beliefs. This is an important aspect of science for our family! The lessons are concise and clear but very indepth. Sound like a contradiction? Not really….the lessons are written in a way that students of any age can follow along and can understand the majority of the concept being presented. At only 7 years old, Curly was able to understand almost all the details of the various topics. There was a lot of meat to the lessons but they were not wordy and long, so she got the facts she needed to understand the concept without being lost in wordy explanations or details. The demonstrations and experiments are invaluable to understanding the topic. I loved how the experiments were often done at the beginning of the lesson. Then the concept was explained in the text. So, you learned by doing and then reading the explanation for what happened in the experiment. This made the concepts very memorable for Curly. The experiments are simple. They really are! Some seemed so very simple that I was wondering what we would be learning. But I was always pleased with how the text pulled everything together and added depth to our learning. And because the experiments were often very simple to perform – Curly was able to do them all by herself! She didn’t have to sit on the sidelines and watch me do her science lessons. She could fully participate and she was thrilled that the lessons were so hands on for her! The lessons use easy to obtain materials. I needed a flashlight, aluminum foil, a CD, a candle, a mirror, a trashbag, and construction paper for some of the lessons. I had nearly every supply already in my home or they could be found at my nearby store. Ohh and the book comes with the ability to log into a website where you can ask questions of Dr. Wile. He will respond and help you with your science questions and experiments. And you can also search the site for previously asked questions and his answers. This is a wonderful resource for the parent who is not a science person. I already have a few questions that I will need to ask about some upcoming lessons – with our food allergies I will have to make a few experiment supply substitutions so I’ll be contacting Dr. Wile to discuss our options. At our house, history is a favorite subject. We spend much of our time reading and reading and reading about historical topics. Science often gets overlooked in favor of other subjects. I’m trying to change that though! And I think I’ve found our answer. Here is a series that covers science from a historical perspective with a Biblical focus. The experiments are doable, memorable, and can be student-performed. The text is colorful, clear, and has excellent experiment instructions. The review section lends itself well to notebooking which is our preferred method of learning. And the tests will be a wonderful assessment as Curly is a little older and is ready for more of a challenge. I will also be able to use this curriculum with all of my children, covering the same topic together as they each complete assignments at their own levels. And we get to study multiple science topics each year as we progress through history. I can even line up the curriculum with our history studies! I am so excited! I loved this book, the layout, and the information presented in it. I enjoyed the experiments. And I’m fairly certain that I learned even more than Curly did as we worked through the book together. I cannot wait for the next books in the series and to learn about the scientists through history. I’m going to admit right now that I’ve never heard of Thales so I can’t wait to start on the next book in the series. In the meantime, I’ll have to do a little research….. This is what we’ve been looking for – an in-depth science learning experience that appeals to a history-loving family! You can follow Dr. Wile’s blog for more information about teaching science and for updates on the release of the next books. Disclosure: I received a free copy of this curriculum in exchange for an honest review. I was not required to write a positive review nor was I compensated in any other way. All opinions are mine. I am disclosing this in accordance with FTC regulations. Don’t forget to enter the giveaway so you can enjoy Science in the Beginning! I have had my eyes on this curriculum and think it will be the answer to our science struggles as well (esp. after reading your review). It is really hard to choose which day I am most excited about so I'll say the first day because we have not yet tackled the topics of light and energy in our science studies so it would be fun to learn about another part of science! I've looked at the website for this and wondered about it. Thanks for the review — and neat to know where the series will be heading! Day 1, I believe. We have read and done tons with space & animals & such, very little with light & energy. Good question…I think day 5 would be my favorite. I'm most interested in teaching about Day 4, when the Creator put the lights in the sky (sun, moon, and stars). I think day 6 would be the most interesting. 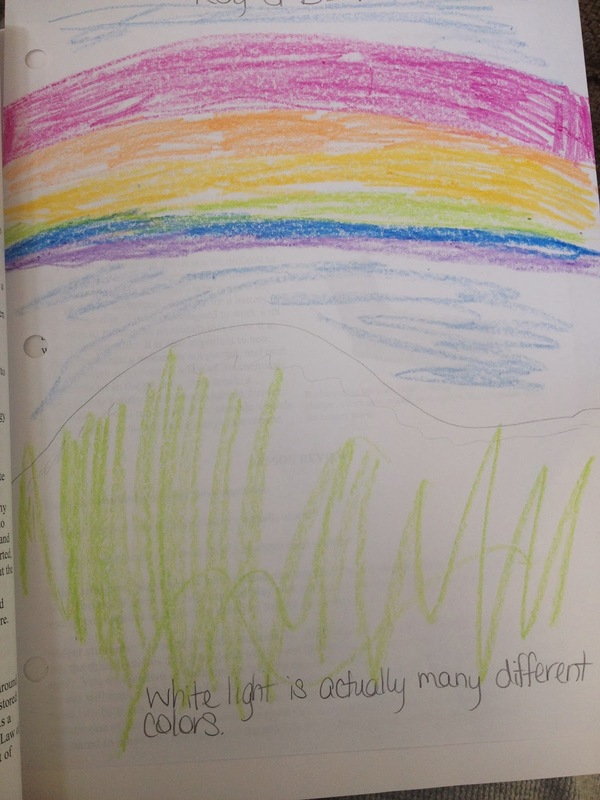 I am looking for a good science curriculum for my 2nd grader, so I am really glad you posted this review. I was excited to see this curriculum come out as I haven't been sold on any one yet. This looks good so good to me. I think I'm going to have to do with day 4, as my son loves the solar system. I think I'd be most excited about Day 4. I think Day 4 would be my favorite to teach. I've been looking forward to reading reviews of this curriculum. I'm not a science person either, so I'm always looking for something new! We are trying SCM's 106 Days of Creation Science right now, which is sort of a similar idea, but this sounds sooo much better! Really excited! SCM's 106 days sort of short-changed days 5-6 (on the animals), so I think it would be great to see how Dr. Wile handled those in 15 lessons. Thanks for hosting the giveaway and such a thorough review! My kids would love day 6! Day 3 is my favorite! Thank you for the giveaway. I love teaching about Day 1! Light is just so… cool! Colors, rainbows… so awesome!! Day 4 – the sun is our source of light, yet the sun was only created on day 4, while light was created on day 1! Probably the 4th day. My son is fascinated with space right now. What a great giveaway! I think I'd be most excited about the lessons on light (day 1). Thanks for hosting. Day 4 or 5 is perfect! Day 1 or day 6 would be fun! I would love to teach the lesson about the 1st day. I feel pretty good with the later days (the biology side) but I think I would love this book for the 1st day especially. The whole thing looks awesome and I love the idea of a chronological approach. I heard Dr. Wile speak at a homeschool convention a couple of years ago and he mentioned his idea for this approach to science but I didn't know that something was actually in the works! I'm so excited to try this! I would love to win this. I've had my eye on this for a couple of months. I think day 4 will be fun to learn more about. Sounds like an exciting series. Do you plan on continuing with Nancy Larson Science and this in the future? Thank you for the review. I have been waiting to see what you think of the curriculum since you said you would be doing a review of it. I cannot wait to try this next year now. Do I have to pick a day?? 🙂 They ALL would be great! ….I think Day 1 and 4 would be fun though! Our little family is going through this book! I can pick it up and just go with it! part of the fun for us is looking up the elements we need for the experiment. I like the fact that my 1st grader is excited about making her own lab notebook which she calls a book, it has a table of contents and a preface lol. My pre-K and toddler enjoy listening and joining us doing the activities…. I love the linear aproach through History, though many will call it unit study, it is a way to see cause and effect in the Sciences. Can't wait to see the other books. I think day 6 would be my favorite! Day 7? I'm all about rest! 🙂 Seriously, I think Day one is a great teaching tool. The thought that God created out of nothing is truly amazing. I think I'd most enjoy using this for the first couple of days — you know, all of the pre-biology teaching. I minored in Biology, and I have entomologists all over my family tree, but honestly, I'm a little tired of elementary biology topics. This looks great! Day 6 would be fun. I'm not sure which day we are looking forward to! We really like dinosaurs around here, but still it will be fun to learn about light too! Thanks for the review, it was nice to see what it looks like from someone who has already started using the curriculum! We've been enjoying going to the Planetarium lately, so I'd say Day 4 would be the favorite around here. This looks like a very interesting curriculum, I'll have to check it out for next year. Thanks! This looks like a great curriculum! I think we'd enjoy days four and five the most. Thanks for the opportunity! Very interesting to read the review. I think I would enjoy learning about day 4 too. I would enjoy teaching all the days of creation! 🙂 My youngest loves science and would probably enjoy all of it too! I really appreciated that you included pictures of the text and a description of how the curriculum works. That is very helpful! I think day 1 would interest me the most. I'm going to say Day Four-my kids love all things space related! I'm really excited about this series! I hadn't yet found a science curriculum that I was completely happy with. This one looks like it might be the one! and oops, I meant to say that day 1 looks like fun for us! I am hoping to win this! It looks like a perfect fit for us for our MFW Creation to the Greeks curriculum. It all sounds great! Day 4, especially! Thanks for such a thorough review! It looks like a great curriculum. My kids would be most excited to learn about Day 6. I'm really excited about this curriculum! Thanks for such a detailed review. Our boys love aquatic animals, so we would be most excited to learn about Day 5. All of the days look so great. Hard to choose one as we haven't covered much in depth yet. I think this would work for us. I don't like science but my boys do. That's a great question . . . I would say Day 1 or 4. This curriculum looks wonderful! I found out about it through a Facebook party one day and have been interested in it since then. When it comes to science, I need something more scheduled for the whole year. By the way – This is a great review! Day 1 would be my favorite to start~ in part because it is "The beginning" and in part because it is something we haven't discussed as much with my 6 yo. The fourth day…. I find it fascinating!! Thanks for the great review! Another vote for the 6th day here. This curriculum looks fantastic! Thank you for such a wonderful review and for the opportunity to win Science in the Beginning! Thanks for the detailed review! I've heard a few people mention this, but this was the best description I've found. We've done so much with animals and nature, so I'm most interested in the balance the earier days would offer. I'm wondering — hoping this doesn't sound horrible — how you found the balance of Bible/Christian references/tone in comparison to, say, Apologia's elementary series. Although I am most definitely a Christian, I find some Christian books to just be…overdone in terms of their tone in that regard and feel like they are speaking down to the child. (No one stone me, please!) Thoughts on how this text is in that regard? I would love to win Science in the Beginning. Thank you for the opportunity! I do plan to continue with Nancy Larson Science. My kids still really enjoy it. However, we usually do two science curricula at one time – say Nancy Larson and Apologia. We do all the things in Nancy Larson and use Apologia more as a read aloud. Nancy Larson also doesn't take us through a full year because my kids want to do it more frequently. So my new plan is to do Nancy Larson each year and then do one of Dr. Wile's books to fill in the rest of the year and over the summer. And to compare them to Apologia – I found them very much toned down. 🙂 I found these less chatty and to have better flow – they are easier to read and follow. They do contain creation information but it is not preachy or annoying when you get to it. I completely understand the question! That's why we really liked this science. It was the perfect balance of information and experiments with a Biblical focus. I've been looking at this book, thinking it would be nice for my children next year. Thanks for the thorough review! I would be most excited about Day 1. Light is so interesting! But, in all actuality, I'm excited about the whole series and elated that Dr. Wile is still producing amazing science materials. I think my daughter would enjoy day 6. The whole thing sounds amazing! Especially if your husband loves History but doesn't believe in God and creation. I love the way it sounds like it would combine science and history. Also starting from Kindergarten and continuing with the curriculum would be great. It would be nice to have such a detailed, well laid out curriculum that lets you get right to it and not have to spend a lot of time preparing things. This sounds terrific. I'd love to try it out in our homeschool. Thanks for a great review. Thanks for the great review! I've been really interested in this science curriculum since I heard about it. I would be most interested in Day 4 since we have not studied any astronomy yet. Thank you for such a detailed review. I am really excited about this curriculum. We have been planning to start science around Christmas, but just haven't been able to choose which Apologia to go with. Then I discovered this new series and I'm seriously excited about it. Literallythe only reason we haven't started yet is due to $! So winning would be the biggest blessing. I'd even review it too. As for he day of Creation. Si don't know. how is "Science in the beginning" different from "Exploring Creation with Chemistry and Physics"
Exploring Creation with Chemistry and Physics is only chemistry and physics topics. The readings are not divided into lessons but there is a suggested schedule. There are multiple experiments throughout each chapter so you can do as many or as few as you want. Science in the Beginning covers many topics – it has a section for each day of creation so there are chemistry and physics topics as well as astronomy, botany, zoology, earth science, etc. 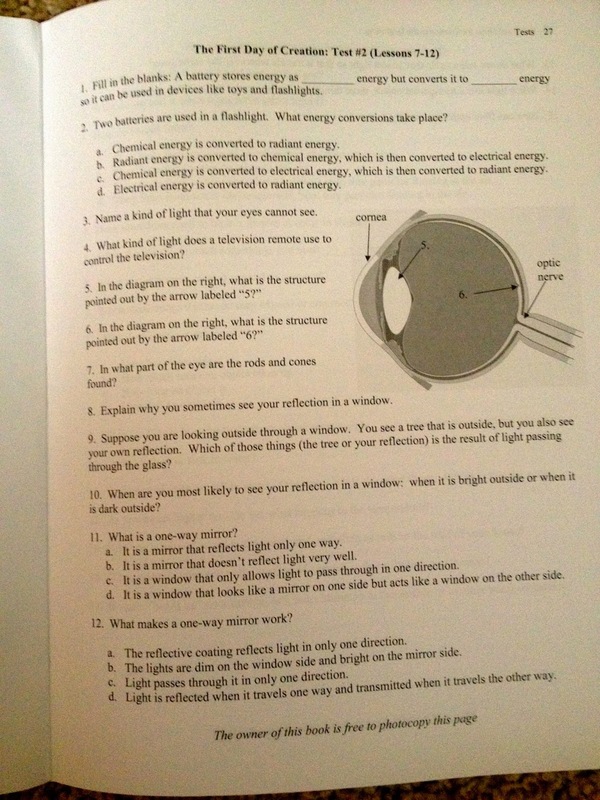 Each lesson is 3 pages with an experiment and review questions. I find it to be more concise in the readings than the Apologia books. Both are creation-based Christian resources. The main differences are the topics covered and the lesson layout. Science in the Beginning covers all days of creation. The next book in the series will talk about ancient scientists and discoveries. It will be arranged historically. The Apologia books cover one topic per book and an arranged by topic.